Top　»　Exhibitions　»　Yuuki Kikuura "NODE"
Bambinart Gallery is pleased to present "NODE", a solo-exhibit by Yuuki Kikuura. The landscapes In Kikuura’s paintings often exhibit a measure of abstraction. The unique characteristics of the places in his paintings are abstracted and only the shapes and colours are figurative. As a result, we can grasp that it is not a specific place that is being signified. The painting is interested in objectively understanding the place that is being depicted and not in the emotions, such as awe or sentiment that can be drawn from the sentimentality of the surroundings nor from the historical background of the place. 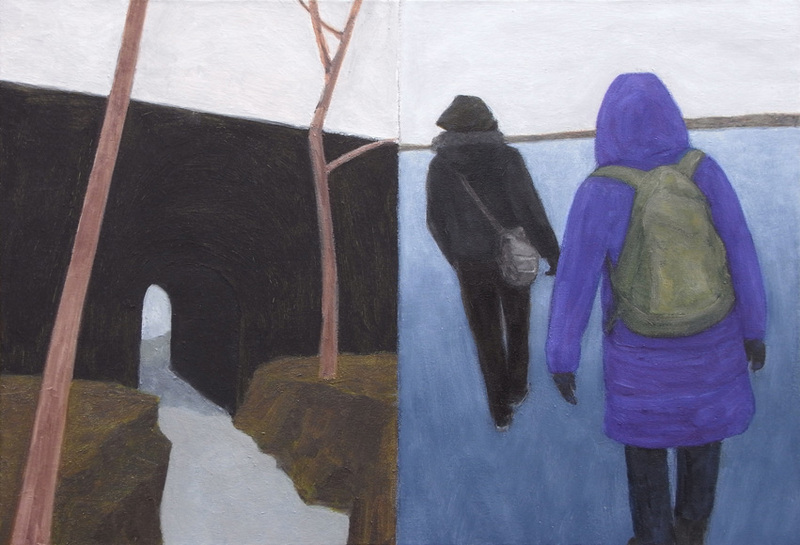 These paintings are comprised of landscapes, or combinations of landscapes, that Kikuura has actually experienced. These assembled elements search for an essence in perception as they repeatedly transform in multiple ways through the colours and brush strokes. The aesthetic gained is a complex relationship between several states of not just shape and colour but also of time and temperature. As this aesthetic loses its vividness with the passage of time, its memory passes over into the painting. Why do we paint? Maybe a clue to this proposition can be found in querying what is possible in a painting.